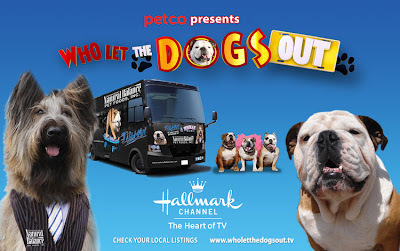 A Tonk's Tail... err, Tale...: Saturday Doubleheader: "Who Let the Dogs Out!" *gasp* Did someone say DOGS? Yep. We had heard that Tillman had a show on The Hallmark Channel, but we'd never watched it. In fact, we've seen Tillman on twitter but we've never before seen him skateboard. But Friday, all that changed. The episode that caught our collective eye was the one featuring BlowPaws 2012. Many of our friends attend BlogPaws, and in fact, we're sending mom as our representative for the very first time this May to BlogPaws 2013! So we told Mommy she'd better watch - yanno, so she'd know what to wear at the conference so she didn't embarrass us or anything. Holy cat! What a fun show! We had never seen Tillman do his thing - and can that dog ride a mean skateboard or what. Color us kitties impressed! And we absolutely loved seeing some of our friends being interviewed about the conference - and loved being able to glimpse a bit of what the conference will be like. We're excited we'll be represented out there this year and expect our mom to learn loads of cool stuff that she can then put to good use on our behalf. Mom was especially pleased to see the segment on brushing your pet's teeth since this is so important - and since February is Pet Dental Health Month. At this point, we discovered this lovely contest being hosted by Tillman over on his blog: they're giving away a 3-night hotel package and a BlogPaws Conference pass to all pet bloggers who post about the show and contest before 11:59 PM (EST) tomorrow. Count us in! I won't be able to attend this year sadly! Good luck to your mom on winning though - that would be pretty awesome! Tillman is pretty amazing! We hope we can get him back to BlogPaws 2013 and then you can meet him in person. I'm glad to hear you plan to join us and I can't wait to meet you. Will you bring any of your cats? I do not get to bring my dogs this year, so I rely on everyone to bring their pets - dogs, cats, ferrets, guinea pigs, bunnies - and I get all my love from them! Good luck in the contest! Wish I Could attend. Too much work at the office! Mom wishes she could go but there isn't anyone to take care of all of us so we just have to listen to the reports. Hope you enjoy. Sigh! Me would LOVES to go, but Mommy has to stay home and take care of Daddy and me can't goes by myself. Not Fair! YAY!!! If all goes according to plan, Glogirly will be there too. I know she's been dying to meet you. I'm thinking some house trashing parties will be in order! How wonderful! Even if we won, Mommy won't be able to attend because she can't stay away from us for that long. Heck, she can't even be away from us for a night. Hee hee. Blogpaws will be here soon or rather over the pond soon. Must be great to meet up. Have a super Sunday.